Nuremberg, Germany, November 1945 and the trials are about to begin. The allies are here in force, the judges, lawyers, stenographers, journalists and the various armies. The German people are the vanquished, many living rough and suffering food shortages. An American soldier is murdered and because he is in possession of stolen food, it is believed that it is a "black market" murder. The local Kripo chief inspector, Reinhard Manhof, believes this is so. When a second murder happens, this time a Russian soldier, the American Colonel Adams in charge of security fears the worst. Then when a French soldier is murdered he knows they need help. Captain Nathan Morgan is recommended, he's ex-OSS and has also been a cop in the USA. He does not believe the Kripo are taking the murders seriously, and arranges for a disgraced ex-German policeman named Beck to get out of prison. Before the war Beck's reputation for tracking murderers was exemplary. Morgan gets romantically involved with an American journalist called Kate Wallace whose father is a Senator, but can he trust her? When further murders are committed and not involving the armed forces, Morgan and Beck are desperate for leads, who is the murderer and why? Colonel Adams is desperate that nothing will deflect attention away from the trials. 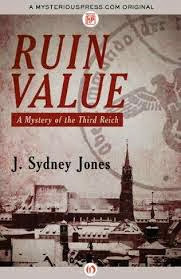 J Sydney Jones is an author new to me; an American based in California but has lived in Vienna for some years and he based a mystery series in this city. RUIN VALUE kept my interest throughout and is well researched. The book title is apparently an architectural concept much admired by the Nazis. I enjoyed the detail about one of Hitler's favourite author’s - Karl May.